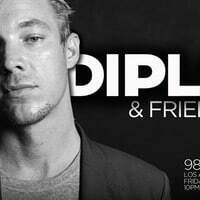 Diplo had a huge year in 2013 and New Years week was no exception. Major Lazer crew (Diplo, Jillionaire, Walshy Fire, dancers Mela Murder and Lafayette Bless) played their last show of 2013 in New York at Pier 94 on Monday night with the aid of none other than Lindsay Lohan. In this video from Instagram, Walshy Fire tries to take off Lindsay's snapback to get her more involved in the show but she remained low key. She is apparently soaking up tips on being a disc jockey according sources like TMZ.